The chart of accounts shows the nominal accounts available in this set of accounts. 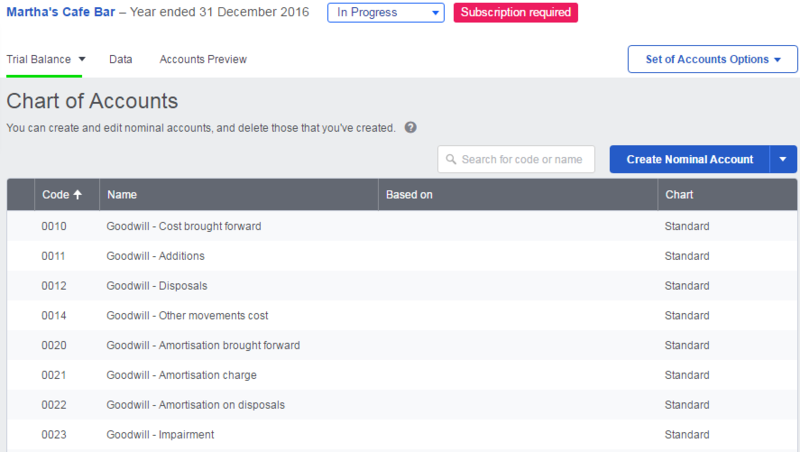 Changes you make to the nominal accounts are contained within this set of accounts and do not affect other sets of accounts. If you make changes to the chart of accounts, you’ll see those changes in all sets of accounts that are based on this one. You can create and edit nominal accounts, and delete those that you’ve created. To view the chart of accounts, Trial Balance > Chart of Accounts. Nominal accounts you’ve added display Custom in the Chart column. Search for a code or name by typing in the search box. Create, edit or delete nominal accounts. Sort the list by clicking a column heading. Export the nominal account list to a PDF or CSV file. To do this, choose the relevant option from the Create Nominal Account drop-down menu.